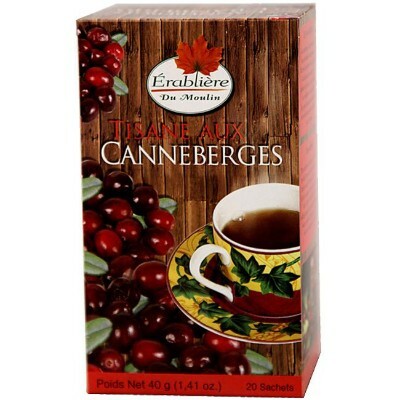 Wet your whistle and refresh with the fruity and unique taste of a steaming cup of cranberry herbal tea. No matter where you are, one thing everyone can agree on is that the tart and sweet flavor of cranberries is utterly delicious. Enjoy this Cranberry tea first thing in the morning or as a fruity afternoon pick-me-up to keep you going all day long! Bay rosehip, hibiscus flower, cornflower leaves, lemongrass, orange tree leaves, orange peel, natural flavors, lemon peels, cornflower bay. Contains GMO. Nutrition facts (for 100ml): calories 1Kcal, total fat 0g (saturated fat 0g), total carbohydrate 0g (sugar 0g), protein 0g, salt 0g.